Girl Guiding is one of the best forms of non-formal education a girl can receive while schooling. Knowing the value of the movement, many parents encourage their daughters to be a part of the Girl Guides Association. 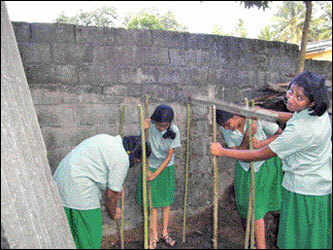 Sri Lanka Girl Guides Association (SLGGA) was inaugurated in Sri Lanka in 1917. Since then the movement has been empowering girls and young women to face the many challenges of life, for over 90 years. Now the Association has more than 30,000 members in all the nine provinces of the country. The SLGGA is divided into three main categories according to the ages of the members: Little Friends aged 7-11 years, Guides aged 11-16 years and Senior Guides aged 16-23 years. The Girl Guides Association is hoping to start a completely new era of guiding in Sri Lanka from this year and "April will be a significant month for all the members of the SLGGA and for those who are interested in joining the Movement in the future. An extravagant event called The 'Rally 2011', will be organised by the Movement, to launch the new uniforms, new programmes and a new image for the association," says Director Communications, Sri Lanka Girl Guides Association, Dilmini Peiris. The last time they had an image change was in 1960s. To give a local touch to the image an elephant was included. New Sri Lanka badges for all the ranks in the three branches were also introduced in that year. Almost 50 years later , there will be another major change in the system. "We need to show the world that our Movement is changing with the world," she added. Rally 2011 will celebrate the spirit of guiding. The members from all over the country will meet their fellow guides at the Galle Face Green in April at this much awaited Guiding event. Stay tuned with the Junior Observer for more information about this rally. Lord Robert Baden-Powell popularly known as BP founded the Girl Guide and Boy Scout. He first worked with boys in South Africa during the Boer War. He had set up his headquarters in Mafeking, but soon this came under siege. Then, BP recruited a few boys as messengers during this difficult time. They divided themselves into groups or rather patrols and each of these patrol had a leader, known as a patrol leader. Since that scheme was a success, on his way to England BP decided that the boys in England, should also be taught similar skills such as camping, teamwork, and leadership, pioneering, stalking and orienteering to prepare them when they were older.Through his book "Scouting for Boys," he explained how he wants to popularise scouting among boys. The book was soon a hit among boys all over England, and they started forming their own scout companies. In 1909, the first scout jamboree was held in London. Seeing some of the girls who attended this rally, BP realized the need for forming something similar for the girls as well. As a result, the Girl Guide Movement was inaugurated in 1910 in the UK. BP's sister Agnes Baden Powell was the first president of the Girl Guides movement. Girl Guiding was first introduced in Sri Lanka in 1917, by Mrs. Jenny Greene and Miss. Jenny Calverley. The first Guide Company was started at the Girls' High School, Kandy with the support of its principal at that time, Miss. Sansom. At the end of that particular year, the guiding oath was altered, so that the non-Christians too can join the movement In 1918, the Ceylon Branch of the Girl Guides Association was formed and Mrs. R. W. Byrde was appointed as Sri Lanka's first Chief Commissioner.